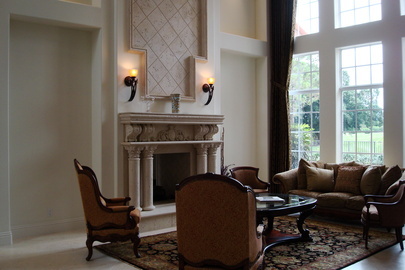 Classic Mediterranean design is touched with the relaxed ease of Santa Barbara style in this magnificent Mizner Country Club custom residence, just completed in 2007, created by nationally renowned builder Tuscan Harvey Estate Homes. The gracious Mizner Country Club lifestyle begins upon arriving at the impressive entrance court, finished with handsome bricks reclaimed from an historic Palm Beach mansion, and continues throughout this eminently inviting residence placing equal emphasis on comfort and aesthetics. Replete with select stone and rich hardwoods, the wonderfully bright rooms flow onto luxurious outdoor living spaces presenting a dining loggia aside the oversized pool with spa. Here, stunning views reaching over groomed fairways are maximized from the superb oversized Mizner Country Club golf course lot. Every discerning requisite is met in this flawless estate in Mizner Country Club, one of South Florida?s best-kept secrets. Property: Residing on expansive landscaped grounds, this custom-built Mizner Country Club estate affords verdant views overlooking the tropical gardens and golf course beyond. Served by a summer kitchen, the dining loggia is refined with coquina stone columns, reclaimed brick, and cypress corbels. 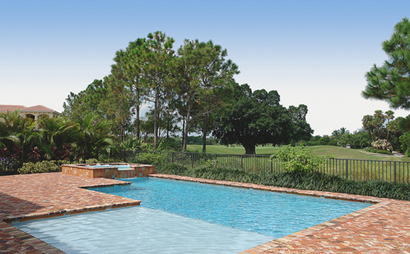 Hand-painted tile refines the resort-style pool with spa. Residence: This warmly elegant Mediterranean villa is meticulously finished throughout 7,330± total square feet with 5 bedrooms, 5½ baths, and 3-bay garage. 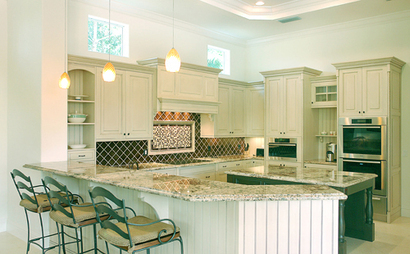 Pecky cypress millwork and coquina stone elements accent the authentic architectural design. Myriad special features include the impact glass windows, back-up generator, surround-sound system, central vacuum, and water purification system. First Floor: Inside the mahogany entry with scalloped detail, the 2-story gallery foyer is illuminated by a custom chandelier suspended from the crown-molded double-tray ceiling. Views across the pool and fairway open through 2-story windows in the step-down living room set off by polished Jerusalem stone flooring, art niches, a decoratively detailed double-sided stone fireplace, and dramatic coffered ceiling with crown moldings. 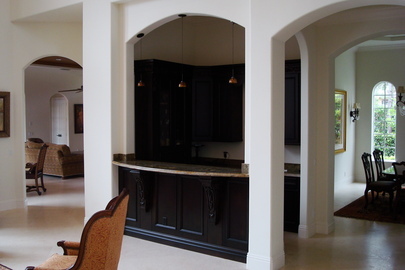 Gracious entertaining is served by a beautifully molded walnut-finish wet bar with granite counter. Lush garden views open through triple arched windows in the formal dining room below a tiered tray ceiling. The gourmet kitchen is a culinary showpiece featuring fine maplewood cabinetry, a walnut center island, granite counters, copper backsplash with Murano glass inset, Sub-Zero double refrigerators and 4 freezer drawers, Wolf range, and other Miele appliances. 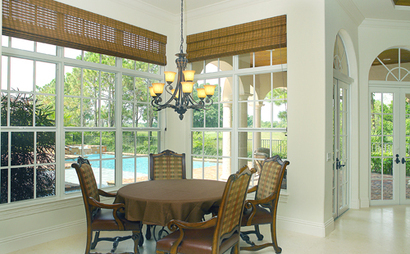 The light-filled breakfast area and family room open to the poolside loggia and captivating golf course views. Sharing the living room?s double-sided fireplace, the office/den/library has rich Brazilian cherry flooring, floor-to-ceiling walnut-finish built-ins, and French doors to the pool patio. The elegant marble powder room doubles as a cabana bath. Two first-floor bedroom suites feature the luxurious master suite entered through a private vestibule. The bay-windowed master bedroom with Brazilian cherry floor and tray ceiling is accompanied by custom-fitted closets, a breakfast bar, and lavish spa-style marble bath with walk-in rain-head shower and jetted tub wrapped in basketweave-patterned marble mosaics. 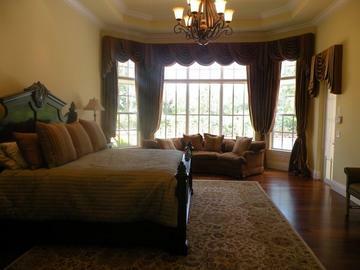 Second Floor: Brazilian cherry floors and tray ceilings carry from the loft area to 3 more beautifully appointed bedroom suites including a VIP suite opening to an expansive balcony surveying the golf course. This entry was posted in Active, Boca Raton Oceanfront Estates For Sale and Delray Beach Luxury Real Estate Listings on November 22, 2013 by AgentImage.